Allyson Caggio on the rampage for the Maxol WIT Wildcats against Brunell on Saturday night. Photo: Noel Browne. 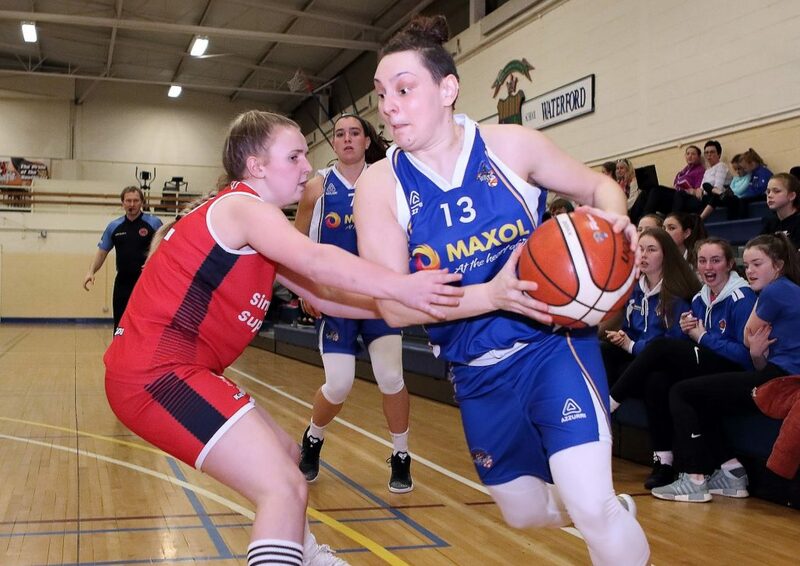 Maxol WIT Wildcats keep in touch with league leaders Liffey Celtics after a convincing 70-51 victory over Cork City side Brunell last Saturday night. That win, their fourth in four home games leaves the pride of the South East tied with three other teams for second place having played one third of their league games. This Saturday night Wildcats face one of those teams when they travel to the Mardyke in Cork city where in form Glanmire provide the opposition. The Cork outfit had been unbeaten prior to last week’s 50-55 home loss to Liffey Celtics who have won all their games with some ease before then. That close encounter shows that Wldcats have a difficult task ahead of them and anything less than their best form could prove costly. Wildcats away form has been disappointing having lost both their games on the road by big margins. It’s vital to win your home games but you must also win some away games if you are to be in the shakeup come play-off time next March. Wildcats will go to Cork with a degree of confidence knowing they have the capacity of beating any team in the league if they produce the goods for an entire game, something they haven’t done to date. Many of Wildcats players were in top form last Saturday when they totally out played a good Brunell team for the first 15 minutes. Jazz Walker was outstanding as were Cathy Kavanagh, Steph O’Shea and team captain Sinead Deegan. By the end of the first quarter Wildcats led 28-18 thanks to 10 unanswered points from Kavanagh and many exciting scores from the others. Things continued to go Wildcats way and midway through the second quarter coach Dimitris Zacharias rested some of his starters. From that point to the halfway stage the tempo dropped, but Wildcats went to the break leading 38-21. During that phase Alyssa Velles and Ruthie Leavy impressed. From the restart Wildcats starting five dominated once again with many wonderful scores from Steph O’Shea and Cathy Kavanagh thanks to well timed assists from the hard working Meibh Maher. Meanwhile the exciting Jazz Walker was notching up a game high 19 points which left the result virtually secured as Wildcats led by 25 points (57-32) at the end of the penultimate quarter. Into the game’s final 10 minutes where coach Zacharias rested his starters and gave quality playing time to the teams remaining players. With nothing to lose proud Brunell battled on to minimise the damage but Wildcats won with some comfort recording their biggest win over the Cork team for some time.